HTC today started rolling out a software update for unlocked HTC 10 handsets available in the US. Weighing in at almost 400 MB, the update (version number 1.53.617.5) seems to be similar to that released last week for European unlocked HTC 10 units. 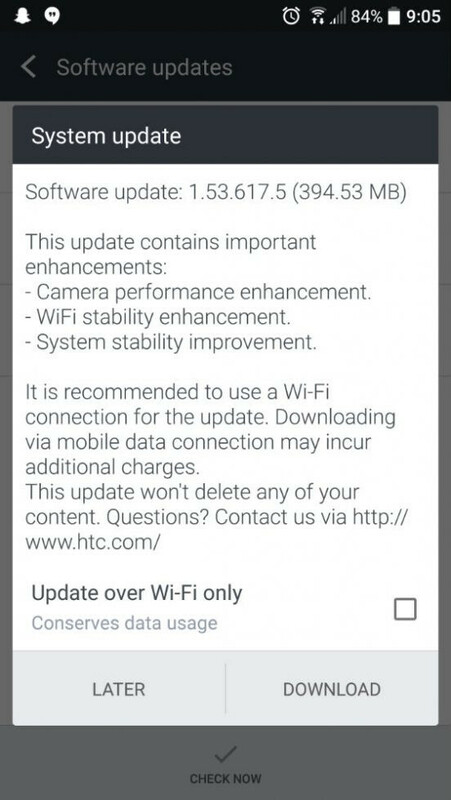 In the official changelog (found via Droid-life), HTC mentions that the new update includes important enhancements related to the phone's camera performance, Wi-Fi stability, and overall system stability. All in all, you'd better hurry up and check if the update is available on your HTC 10. Besides being sold unlocked in the US, the HTC 10 is also offered by Verizon Wireless, and should soon be sold by T-Mobile and Sprint as well. We assume that carrier versions of the handset will get a similar software update, too. Succeeding the One M9, the HTC 10 is HTC's first international flagship smartphone to sport a Quad HD display (5.2 inches), and we think it's one of the best handsets made by the company in recent years. To find out more about it, check out our HTC 10 review. Check out phandroid.com they have the comparison you're looking for. A lot of Samsung fan boy reviewers won't do that because the 10 may make their phone look bad and of course, we can't have that, can we? which is said by a htc fanboy.